One not so commonly talked about feature in Podio is the ability to use Markdown within Text type fields, Calculation, Tiles and Comments. I only found out about this because I was looking for different ways to highlight text (Bold, Italic, etc..) while developing my Navigation Calculation Jump Links . What I found was that within areas of Podio that support text, but that do not have the standard Text Editor, Podio supported something called Markdown syntax. 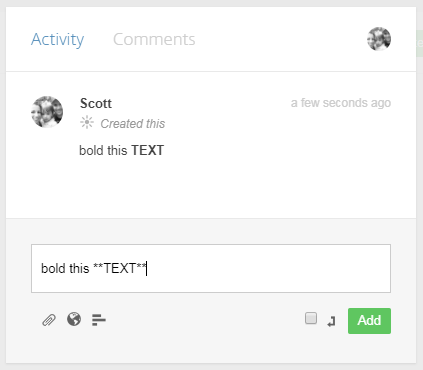 Below is an example of the Podio Text Editor. 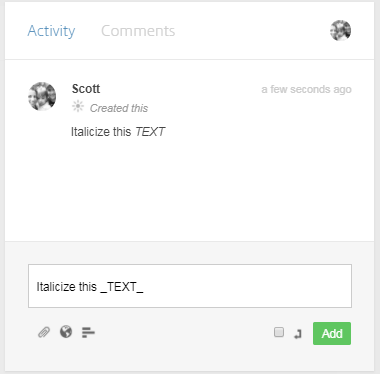 This makes sense, because what if you wanted to add some formatting to a calculation field result or a comment, you normally could not because there was no editor controls. Enter Markdown Syntax! How to use Markdown in Podio? Like I mentioned before, there are 3 areas in Podio where you can use Markdown. 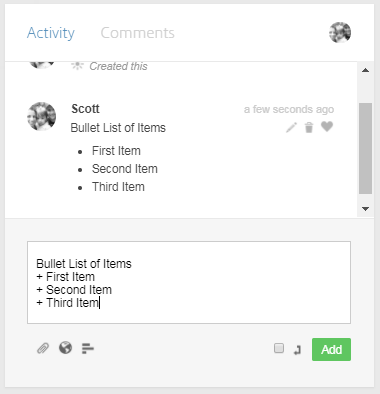 Those are a Calculation Field, Tiles (on Activity Dashboard) and the Comments areas. The comments field is pretty straight forward, while using markdown in a calculation requires some work. To use Markdown in Podio comment fields you'll just be adding the "tags" before and after the text that you want it to affect. 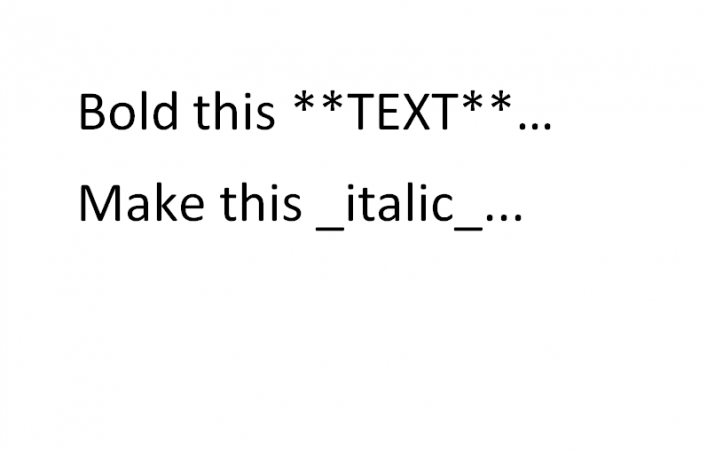 In the below example I am making the word TEXT appear italicized TEXT. 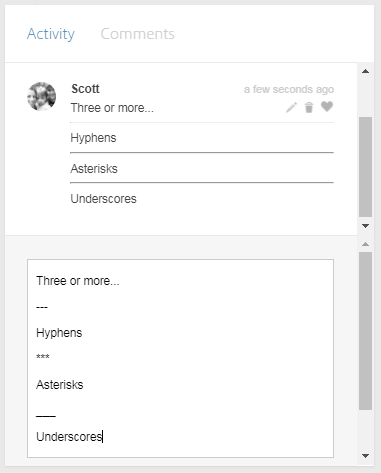 I did this by adding the markdown tags for italic, the underscore ("_") before and after the word. Below are more examples of what you can do with Markdown in a comment. Click on the image to see a larger picture so you can read it. You have the basics down, so now I'm going to step it up a notch. Markdown can be used in Podio Calculation Fields. This is really helpful when you want certain information to stand out. "Text to Display from field: **" + @FieldName + "**"
"Text to Display from field: **This is the field value**"
See how i'm not using the dummy variable in my output at all. Podio is okay with this and I use this trick all the time. This might not seem that hard, but it can get crazy quickly if you introduce line breaks and tables. The issue is that markdown syntax in Podio is very picky and must be formatted exactly. If not then it won't work. Let's take a look at making a table. 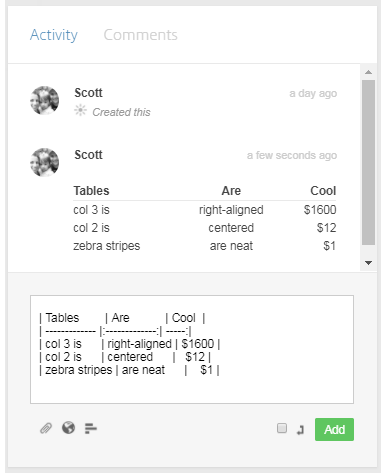 "| Tables        | Are           | Cool  |"
+" \n | ------------- |:-------------:| -----:|"
+" \n | " + @Title + " | right-aligned | $1600 |"
+" \n | col 2 is      | centered      |   $12 |"
+" \n | zebra stripes | are neat      |    $1 |"
The markdown syntax for a table requires that each table row be on a separate line so you need to add in the new line code ("\n") before each row. "\n | col 2 is      | centered      |   $12 |"
In the example above I like to break the rows up into there own actual lines to make it easier to read. To do that you need to terminate the string by adding a closing end quote. I then have to concatenate each line together by using the '+' sign before each new row. However, You do not need to do this and just have the entire table code in one long string like so..
"| Tables        | Are           | Cool  | \n | ------------- |:-------------:| -----:| \n | " + @Title + " | right-aligned | $1600 | \n | col 2 is      | centered      |   $12 | \n | zebra stripes | are neat      |    $1 |"
Markdown is used in many applications outside of Podio. 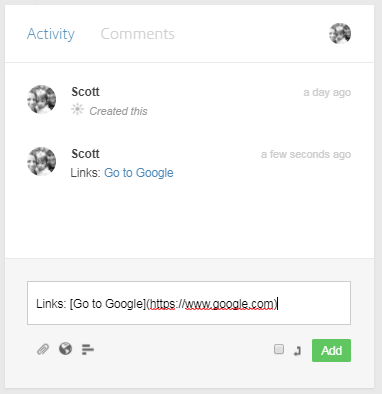 While it works well in Podio, not all of the features are compatible. One of those features is the video tags. Podio will just ignore the tag. Header tags (# - H1; ## - H2; ### - H3; etc..) sort of work in Podio. 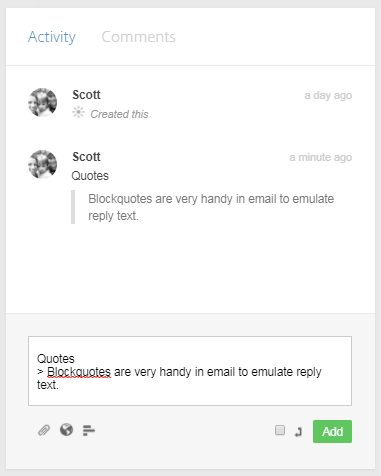 You can use them, and they do make the text larger like a header should be. However, no matter which header size (H1,H2,H3,etc..) you wish to render, it will come out the same size. Which is slightly larger then the normal Podio text. To get a full list of all the markdown tags take a look at the links below. While most will work in Podio, some do not at this point in time. You never know when Podio will support new features. So give them a try. I use markdown all the time within my Podio calculation fields, Globiflow generated comments and even in the Activity App Tiles. One excellent use is showing a google maps location. Take a look at my article for doing just that below. 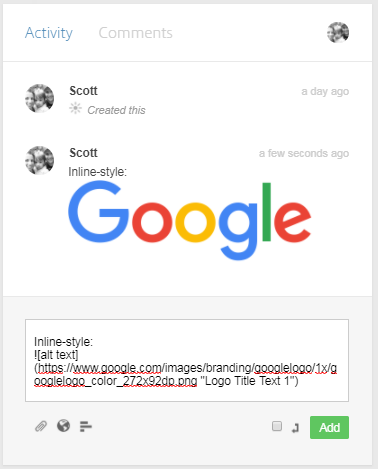 You'll recognize the use of the Image Markdown syntax. Great content. Is REIFlow open?